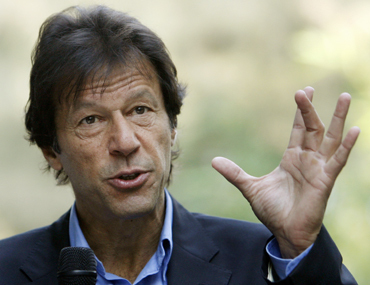 Pakistan Tehrik-e-Insaf chief Imran Khan has accused the ruling Pakistan People’s Party and main opposition Pakistan Musolim League-Nawaz of providing ‘refuge’ to terrorists of banned groups, including the Lashkar-e-Jhangvi, and making seat adjustments with them for the upcoming general election. "The Sunni-Shia conflict has an international dimension but the government here is responsible for sectarian violence," he said while talking to mediaper in Lahore. He alleged that the support extended to terror groups by the Pakistan People's Party and the PML-N has added to the menace of terrorism. The LeJ has claimed two recent bomb attacks on the Shia Hazara minority in the southwestern city of Quetta that killed nearly 200 people. Interior Minister Rehman Malik has accused the PML-N government in Punjab led by Chief Minister Shahbaz Sharif of harbouring LeJ activists. "If the Punjab government arrests over 750 wanted men of the LeJ and other banned groups, there will be peace in the country," Malik said. Khan reiterated his demand for Pakistan to pull out of the war on terrorism, saying this alone would help restore peace in the country. "My party, if voted to power, will take the country out of the America-led war on terror and initiate dialogue with the Taliban. We will also ban foreign funding for terrorist organizations," he said. He said his party has always been in favour of talks with the Taliban. "Today all other parties are backing our suggestion," he said.